Thanks to some days off work, last November I had the chance to read the book “Coach Wooden and me“, written by Kareem Abdul-Jabbar. As stated in the title, the book primarily talks about how the friendship between coach John Wooden and the author developed throughout the decades, despite the fact that he played for the UCLA Bruins for only three years (from 1967 to 1969). 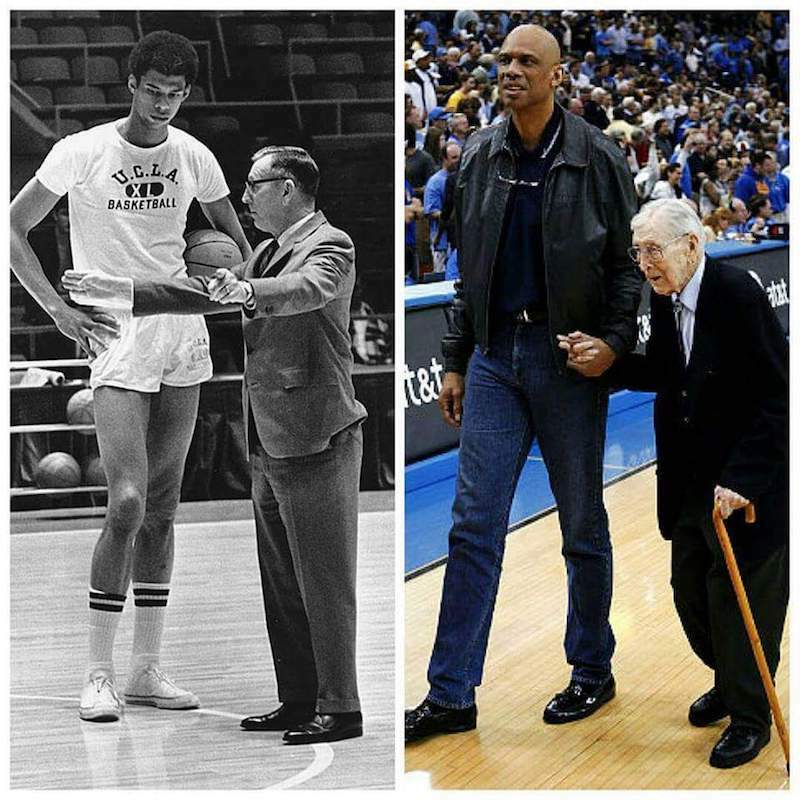 In fact, after Abdul-Jabbar graduated they were in touch until coach Wooden passed away in 2010. During this 50+ year friendship, they established a two-way mutually beneficial relationship, even though Abdul-Jabbar generally played the role of the apprentice. Although it is not strictly a book about basketball, in Abdul-Jabbar’s work there are still several passages which I think would warm any true basketball lover’s heart. I believe that some of these excerpts should be used as the official definition of this wonderful sport because they perfectly describe its essence. In coach Wooden’s view, the ultimate goal of basketball is not to win the games but to develop the players as people, in order to shape individuals who are ready for the challenges they will cope with once they are not students/players anymore. In other words, he rightly thought about basketball as a tool of education rather than a means to achieve victory in a competition. This is exactly the purpose of this complex game, as it was conceived and spread through the universities of late 19th century. Of course, the victory is important but, according to Wooden, it is not the goal per se. Rather, it becomes the inevitable consequence if the team worked hard and every player pushed himself to the limit from the physical, emotional, and mental standpoint during the preparation for the game. Another fundamental concept that is stressed repeatedly throughout the book is teamwork. Needless to say, this is the foundational principle on top of which all the game is built. To describe coach Wooden’s philosophy, the author uses an evocative comparison with jazz music which he learned to love when he was a child, thanks to his father who was an amateur musician. In one passage, Abdul-Jabbar tells coach Wooden that their team was like a band playing jazz because they had the freedom to improvise on the basis of a common framework, shared by all the players. Coach Wooden, in fact, taught his players to read and react to the situations they had to face on the floor. They had the freedom to play solos like virtuoso musicians but they were able to do that in the context of the team, in order to put their talent at its service, rather than at the service of their individual statistics. With regard to the role played by fate and luck, the opinion of coach Wooden is very clear. For example, when one of his players had the misfortune to “explain” a missed shot or a defeat, Wooden used to remind him that, to a large extent, fortune is determined by preparation (“The harder you work, the luckier you get”). I totally agree with this thought which reminds me of a famous sentence that Kobe Bryant likes to repeat frequently: luck is when preparation meets opportunity. He sent a very strong message about the importance of the respect of the roles. In the context of that basketball team, he was the person in charge. As such, he was fully entitled to decide to spend an entire session about this apparently silly thing. He used this practical example to explain the importance of attention to detail. If not worn properly, the socks and shoes can cause feet to develop blisters that prevent the players from practicing or, even worse, playing the games. This, in turn, can damage the team profoundly. To emphasize this concept, he used a little story talking about an army which lost the war because a horse of the cavalry was not shoed properly and this triggered a catastrophic sequence of events that led to defeat. He actually taught his players how to wear handle the socks and the shoes properly! In a previous post, I talked about the importance of sharing goals among the members of a workgroup. The approach used by coach Wooden to select the players was very similar to this idea. In the 60s, the main criteria by which the players were selected by the college basketball coaches were the statistics of the games they played in high-school. Of course, Wooden took into account these numbers but it gave more importance to other aspects of the life—his values, in the first place—of the person he had in front of him. This is so true that the first thing he told Abdul-Jabbar when they first met was a compliment about his excellent school grades and not about his outstanding statistics. Coach Wooden thought that selecting a homogeneous group of people with these extracurricular abilities is a necessary condition to build a cohesive team. Abdul-Jabbar depicts an overall description of the game of basketball of the late 60s which makes the comparison with the current times even more glaring. The small but frequent changes brought to the game that the fans have tolerated over the years distorted this sport so much to make it unrecognizable. Today, it has sadly turned into a gigantic business whose main goal is the profit of the leagues and the teams (I should have written the companies). As often happens, the sport faithfully reflects—or even anticipates—the evolution of the society of which it is an inseparable part. The slow but constant transformation which basketball underwent reminds me of the parable of the boiling frog. I really hope we will be smart enough to jump out of the water before it is too late, in order to restore a pristine implementation of the game, like the one sketched by Kareem Abdul-Jabbar in “Coach Wooden and me”. The featured image source is http://lagiornatatipo.it/wp-content/uploads/2017/09/6u2bp2u.jpg. For example, think about the poor quality of many today’s entertaining TV shows.